I don't know about you but for me January sometimes feels like the gloomiest month of the year. Wet, miserable days and darks nights [bloggers nightmare] can leave you feeling a bit low and miserable can't it? The weather definitely affects my mood. On top of that I don't sleep well at all and it's not a good combination, just ask Mr C!! :) Fear not though, we're coming out the other side now. I've decided to take advantage of the dark nights though and cosy on down the minute I walk in from work. Even if I have to cook tea I'll do it in my slippers and pjs sometimes. I'm learning to unwind a bit more and I'm trying hard not to walk around the house with my phone glued to my hand. That's difficult though, I feel like I've lost a limb! 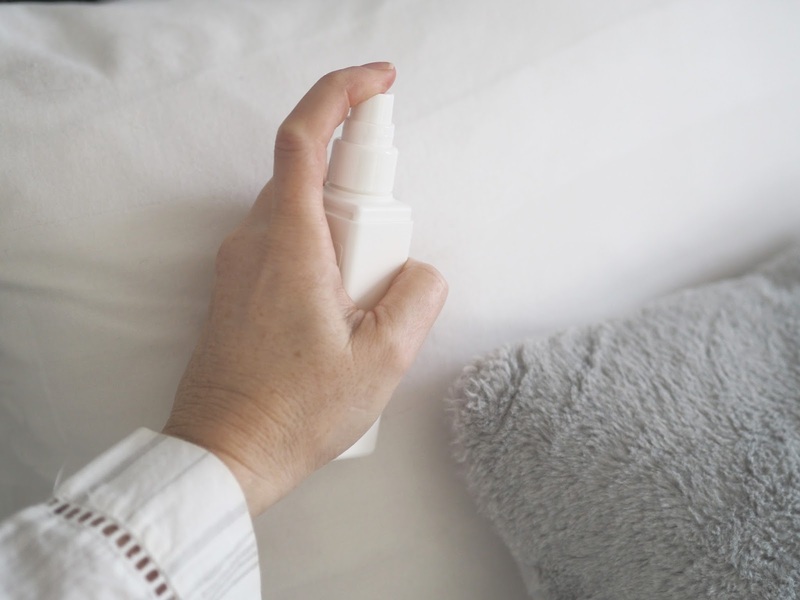 I'm not going to tell you anything groundbreaking here but thought I'd just tell you what I've been doing to help me unwind and sleep better as it's working for me. The minute I walk through the door from work its shoes off and slippers on. My whole body lets out a big fat sigh the minute I slip my toes in to the comfy, familiar fluffiness, seriously there's no better feeling. Anyone that knows me, knows I ALWAYS have a pair of slippers on. Wait for this, I even take a pair on holiday with me, yes, even to hot destinations. Got to have comfy trotters. That's what Nick calls them, trotters, not just anyones feet in general, just mine as he thinks they look like actual trotters. Charming. They don't by the way. Slippers are my thing, I have this weird kind of love for them but they have to be fluffy. The fluffier the better. 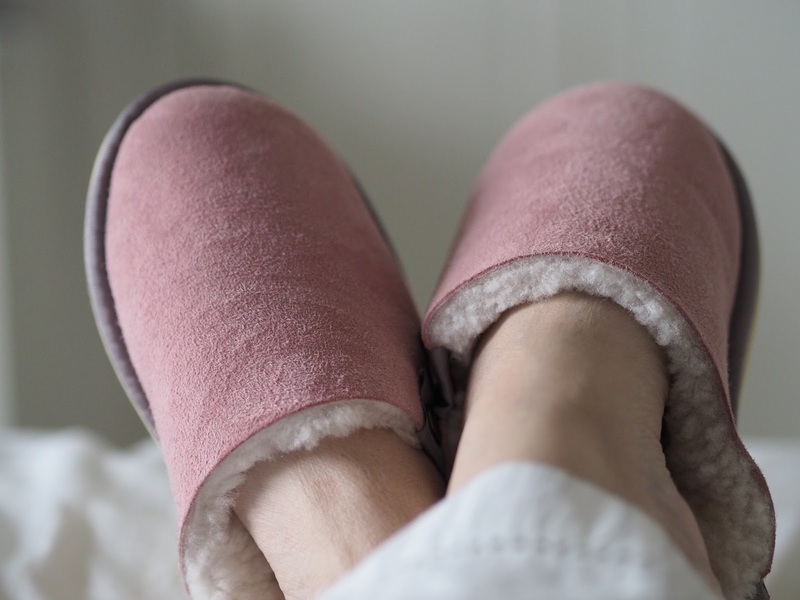 These sheepskin slippers* tick all the boxes. 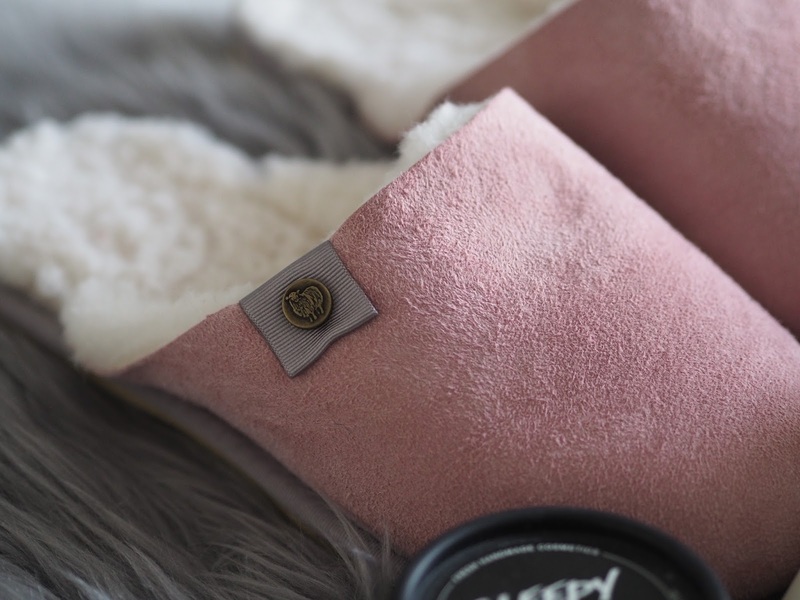 Slip on mule style, super fluffy and warm and they're PINK!! There a bit like my womens sheepskin boots, I never want to take them off either!!! Can't live in just boots or slippers though can you? I'm then upstairs to get the clothes off and pj's on. It may only be 6pm but who cares, has to be done. You can so get away with it in January. Actually, thinking about it, perhaps there IS a better feeling than putting your slippers on? Taking your bra off!!!!!! I know you sistas are all with me on this one. WHAT . A . FEELING. If you don't want to put your pyjamas on, just change into some comfy lounge wear, it helps your mind and body start to relax. I did say I'm trying not to be on my phone constantly in the evening and I'm not, I'm doing really well on my three step phone addiction program (withdrawal issues are real though, what can I say, I miss you guys!) I'll use it to listen to a podcast, something I'm only just getting into but they're great to help me wind down a bit. I'm so useless at reading these days, I'm seriously awful, I haven't picked up a book in about 9 months at a guess. The problem with me is that I'll start and then I can't stop and end up reading into the wee small hours. Not good for the getting more sleep item on the agenda. I am going to try and get a book or two in though as I do enjoy reading. I'll often pop a face mask on when I go up to bed. I'm not one to do it in the morning cos I don't have the time, so I'll do mine in the evening then I can actually sit or lie down with it on. 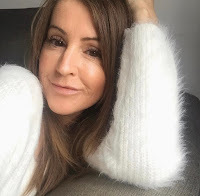 There are so many different masks that I love at the minute for different reasons but I have always been and always will be a huge fan of the Liz Earle brightening treatment mask. I did a recent post on some of my faves here if you fancy a look. 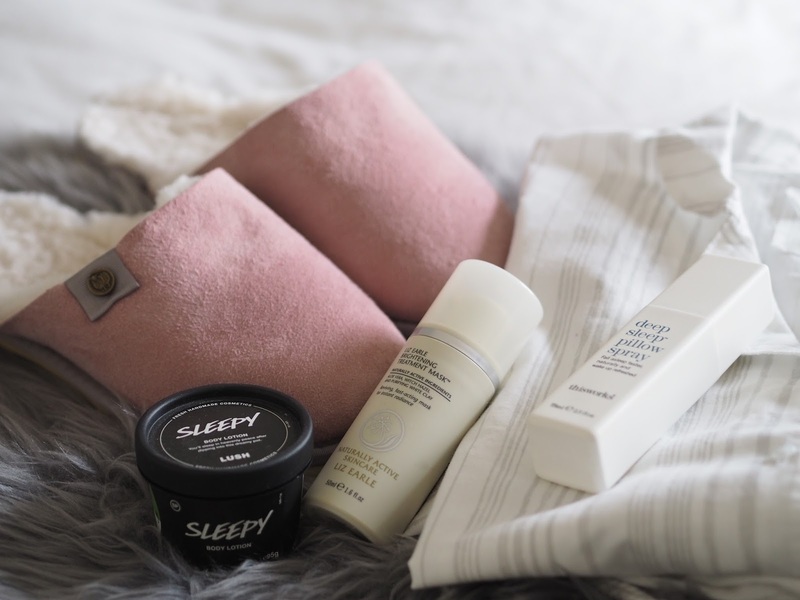 To finish off my pamper and wind down I'll use the sleepy body lotion from LUSH. Have you tried this stuff? You should, it's heavenly, only if you like lavender of course. I adore lavender but I don't think this is a strong in your face fragrance, it's quite subtle and helps you drift off. It lingers on your skin and pjs so you get a gentle waft as you wake! Last thing before I hop into the sack, spray bedding and pillows with a deep sleep spray. 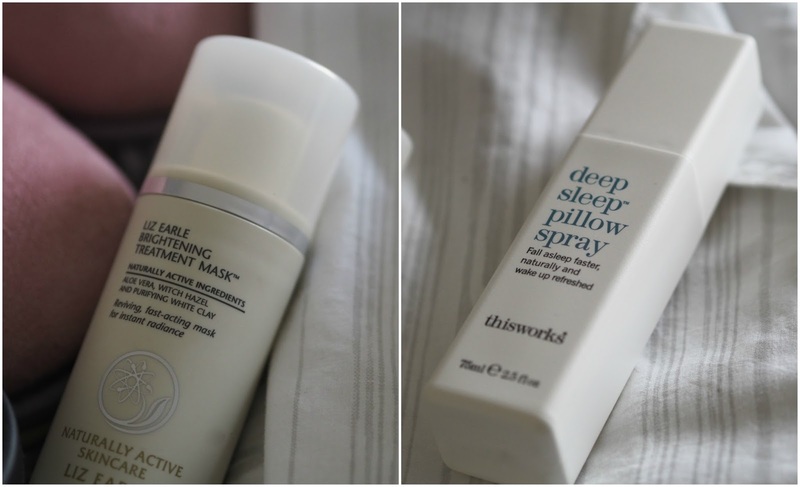 I'm currently using the This Works one as I had it for Christmas but I know it's quite expensive and there are cheaper ones out there that do just as good a job. I know Boots do some of their own and they also do this one that a friend uses and recommends. Just one other thing before I love and leave you guys and that's yoga. I thought I'd throw it in as it does help you relax and unwind. A couple of weeks ago I was listening to Estée Lalonde talking about the 30 day yoga program she was doing at home and it got me all interested. My gym membership is currently on hold [for various reasons], I keep telling myself I'll get back there one day, but knew I'd be able to do this at home at my own pace. It's the TRUE 30 day yoga program with Adrienne, who is so lovely and easy to follow. I started with the program quite late but it really doesn't matter, I'm only about half way through my yoga journey. On the days when I'm working I'll do it when I get home before I start the process as stated above, certainly will NEVER get my arse up early to do it before I go to work, I mean who does that? I've linked Adrienne right here for you if you fancy giving it a go, and it doesn't matter that you'll start the program in Feb. DO IT. So, there you have it, my top tips. 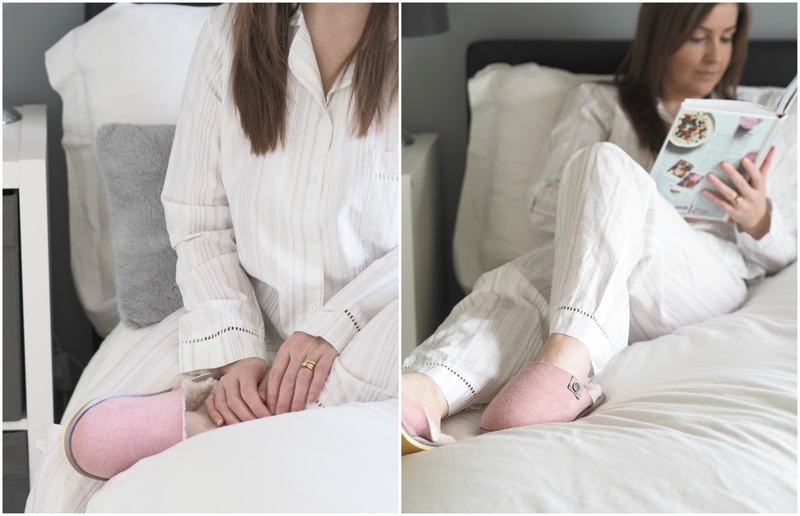 Get yourself all cosy on these dark nights, treat yourself to slippers and new pjs if you have to, light a candle and pamper yourself. Put yourself first. Couldn't agree with this post more Steph. Slippers is definitely the first thing I do! And also as you mentioned, sometimes, the pj's might go on as well! And why not! I definitely could do with getting back into reading. I have a book on my Kindle that I always think I need to get back into and finish, but I just can't seem to pick it up! Must try harder! It's so easy to neglect ourselves isn't it Caroline, our lives are so busy but self care is important even if it pjs on at 6pm! !